While we talk about soil and dirt this week it can be hard to see the connection with this story of miraculous healing. Jesus opens the eyes of a man born blind by rubbing mud and spittle on his eyes and asking him to wash. Maybe it was an ancient medicinal recipe? ; maybe it was folkloric hocus-pocus? ; or maybe the mud is to be taken more metaphorically or lyrically than literally? The story is of Jesus who gives sight to a man who previously had a limited amount of it. He is able to survive and live with his blindness. Yet because of historical and theological beliefs dating back to the scripture of Exodus 20:5 “You shall not bow down to foreign gods or idols or worship them; for I the Lord your God am a jealous God, punishing children for the iniquity of parents, to the third and the fourth generation of those who reject me..” If this man was born blind, undoubtedly it was because of the sin of his parents or other ancestors. Jesus is asked about the reason for the man’s blindness, but he answers instead about of its purpose. The rest of the story, following the healing, is about theological constructions and conflict. The religious leaders cannot tolerate this healing, the sight that the man’s opened eyes bring about the practice of sabbath, the role of sin in society, the institutional power of the clergy which structures Jewish life. The end up driving out the man because they deem him unclean: a sinner. Jesus finds him, brings him in, recognizing him as a child of God, worthy of God’s love, spiritual wholeness, and full sight. The story is punctuated with contrasting metaphors of blindness/seeing; light/dark; chased out/found; judged for who one is/judged for what one does or says. The underlying theme of the story is fertility. That’s what’s important about land, dirt and mud. It can produce miraculous harvests, seemingly by itself. Yet if the land is infertile worn out, worn down, overworked, mistreated, trampled upon, then it is good for nothing. But what we deem to be “good” or “fertile” soil is different than how Jesus judges and plans. Think of the parable of the Sower and the Seed. The farmer sows the seed everywhere, on the soil that were told is bad (on the path, in the thorns, among the rocks) and in the good stuff. For God though all soil is fertile, laden with the possibility of growth in God’s love, grace and call. We never want to be treated like dirt, yet maybe that’s the point from which God wants to gather us in through love into his will which is often poetically portrayed as a harvest meal (Isaiah 2, 25; Micah 4). How do you treat yourself like dirt? 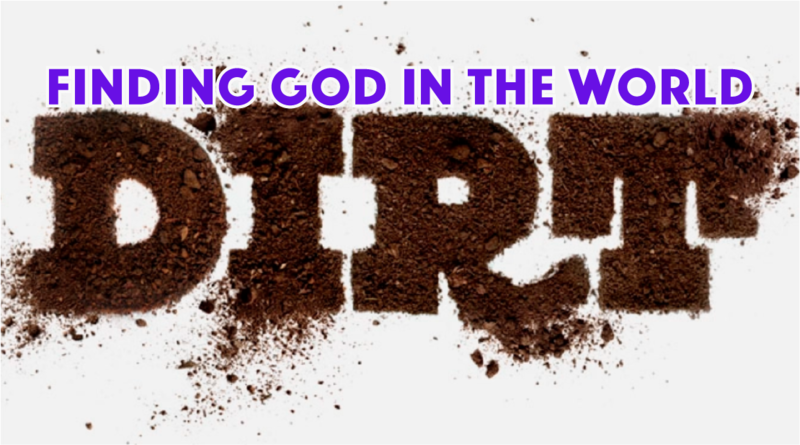 How might God be longing for you to realize that you’re good soil? How is God calling you – and us – to sow the seeds of God’s Word and Kingdom in all dirt, recognizing God’s power to make everything fertile? Download the text study guide PDF that we’ll use in our Vocabulary of Faith conversation at @CAPCOakland HERE.